Peace: It’s time has come! The letter “Ploy for attention” by Hilo High School counselor, John Casey Carpenter on 2/27, was a cheap shot. I have spoken at Hilo H.S. before and at schools throughout the state for over 40 years in a low key fashion. The present controversy erupted over an attempt to control the content of my speech. The free speech issue at Hilo H.S. is about the American bill of rights which was designed to protect the minority from the tyranny of the majority and a government run a muck. The minority in the present case is the voice for peace and non-violence. 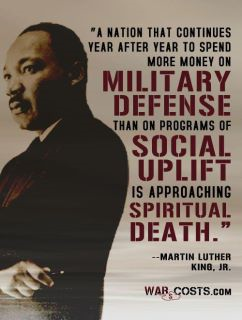 The tyranny is represented by the “Sacred Cow” of militarism, policies of endless wars, increasing special ops and drone attacks, a bloated military budget that dominates social programs, and is reflected in Jr. ROTC programs and military recruiters on High School campuses, with little or no room for a voice of peace and non-violence. and avoid a costly and embarrassing first amendment lawsuit for school officials. The proposal contained the following 3 points. 1. Have Principal Dircks publicly state I’ll speak to the classes at a later unspecified date, but within the next month. 2. My speaking can be in a classroom, not necessarily the Hilo H.S. Library. 3. No publicity on dates I will speak so it doesn’t draw right wing opposition to the school. Let the reader decide if this was a “ploy for attention” or in everyone’s best interest. Why is it so difficult for us to deal with issues regarding the military? I think it’s in large part because we have so little practice, a result of the news media treating the military as a “sacred cow” and generally exempt from critical local reporting. I think this is unhealthy for all of us. Local news reporting on the military is typically limited to coverage of “patriotic” events and holidays, stories on the Defense Department’s economic contributions, change of command ceremonies, emotional “going to war” departures and homecomings, and various repeats of the “service men and women as heroes” theme. All those things might be true, but they are far from the whole story, or even the most important part of the story. We don’t often get real reporting about military institutions and policies, the kind of reporting that uncovers uncomfortable facts and seeks accountability and transparency. Even Stars and Stripes, the military’s own independent news service, generates harder news than our local media. The Hawaii Tribune-Herald (www.hawaiitribune-herald.com) printed front page news stories on Friday, Feb. 22nd and today, Tuesday Feb 26th about the Free Speech Controversy at Hilo High School — my on again, off again, on again speaking to students about peace and non-violence. I’m now due to speak on March 6th and 8th. Civil Beat in Honolulu also covered the stories as well as the following blogs and net news service: ilind.net, bigislandchronicle.com and bigislandnow.com There may be others that I am unaware of. Lots of letters to the editor and blog comments. Some people told me they also heard it mentioned on local radio stations. Please let me know if you are aware of other news/blogs, etc. carrying the story. I think the entire process has been an educational event. Mahalo. I was informed on Wednesday, Feb. 20th in the late afternoon that my scheduled speaking dates of March 6th and 8th at Hilo H.S. had been canceled, because threats were made and the content of my speaking “was going to disrupt the school.” I contacted the Honolulu office of The American Civil Liberties Union (ACLU) for assistance on Thursday morning, Feb. 21st. ACLU Legal Director Lois K. Perrin talked with attorney Eric Seitz who said he would be happy to assist in the matter. Attorney Seitz, representing me, wrote a letter to Hilo H.S. Principal, Robert Dircks, informing him that unless my invitation to speak was reinstated by the close of Feb. 22nd, a civil liberties lawsuit would be filed in Federal Court to compel the school to do so. On Friday morning 9:57AM, Feb. 22nd I sent Principal Dircks the following “Proposal for a Win-Win situation” with copies to Mayor Kenoi and attorney Eric Seitz. and avoid a first amendment lawsuit? It’s made in good faith. Your feedback would be appreciated. PS Principal Dircks, I am disappointed that you have not responded to my phone call and email to dialogue. Teacher Joseph Watts informed me that you said “threats” were made. I emailed to ask you if the threats were to you, the school, or myself and if you have notified police to investigate but I haven’t heard from you. Why? At 12:30 PM Friday, I received a cordial phone call from Principal Dircks, apologizing for not calling earlier. He said he liked my proposal. I said since I was now represented by council, it would be best for him, or the school’s attorney, to contact my attorney, Eric Seitz. At 1:40PM Friday I received a phone call from attorney Eric Seitz saying it appears an agreement has been reached for me to speak again at Hilo H.S. but the dates may have to be adjusted because of security concerns. Attorney Seitz will be working with the State Attorney General’s office on a letter of understanding and that filing the Federal Court case would not be needed. Aloha, Mr. Albertini. I appreciate the conversation that you and I had. Again, I humbly apologize for my delay in response. I appreciate your draft proposals. I am currently working with my leadership team in view of the unexpected turn of events relating to some e-mails that were sent after the original plans were made. What started out as an organized, well- developed classroom presentation plan, ended up to where we are now with the need to ensure a safe and secure learning environment for all my students. I am currently working with Mr. Watts on a plan to keep to a similar timetable as expressed between Mr. Watts, yourself and the other presenters. In my minds-eye, I do not expect a debate or forum but to have the varying positions shared on different days. This will allow students to focus on the presentation of the speaker and facilitate a question and answer period from our students. Hilo High School always welcomes community members to speak on topics that are aligned to our social studies standards.